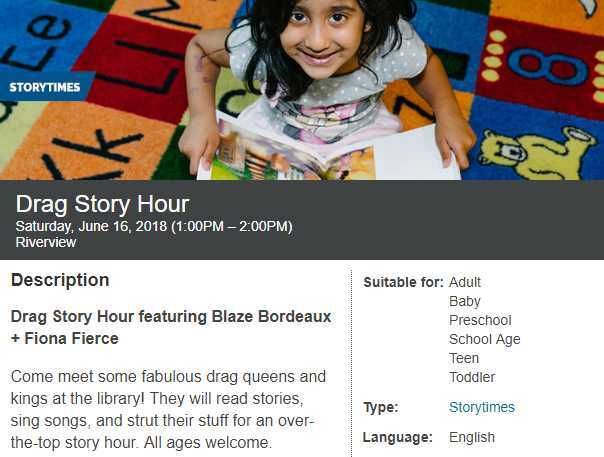 SAINT PAUL, Minn. — A library system in Minnesota is raising concern as it recently announced that it will be hosting three “over-the-top” drag story hours in June and July, billing the event as being geared toward families and suitable for babies, toddlers, preschoolers and teens. “Come meet some fabulous drag queens and kings at the library! They will read stories, sing songs, and strut their stuff for an over-the-top story hour. All ages welcome,” a press release from the Saint Paul Public Library system reads. The events coincide with homosexual and transgender pride month, and is being held in conjunction with the organization Flip Phone, which features a number of risque photos on its social media pages. The story hours are stated to feature two drag performers each, which include women dressed as men, also known as “drag kings,” at some events. The first event was held on Monday evening at the Rondo Community Library and featured drag performers Utica and Sasha Cassadine, who read stories, sang songs, and danced with the children in attendance. One of the stories read was “Julian Is a Mermaid,” a book about a boy who wants to dress up like a mermaid after seeing three women do so. The children also gathered around one of the men dressed in drag for a group photo. Some local residents and others have expressed concern about the story hour, writing messages of opposition on the system’s social media pages. “I would sue your library if I ever walked in with my children and they seen such disgusting things. This is shameful. This is sick!” one commenter wrote. “I want my tax dollars back,” another stated. Flip Phone had stated that the library was being “mega-trolled,” but most remarks of opposition are no longer viewable. It is unclear as to whether or not they were deleted by library staff.